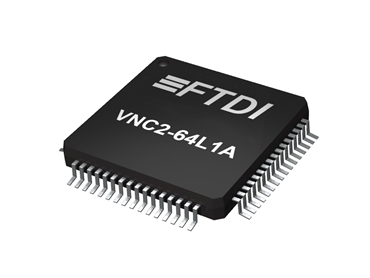 Future Technology Devices International (FTDI), available through Glyn High-Tech Distribution , recently announced the launch of their Vinculum VNC2 user programmable dual USB 2.0 Host/Slave intelligent SOC controller. Building on FTDIs competitive advantage of fully supporting designers and customers by delivering a complete solution, VNC2 enhances the initial member of the Vinculum family, the VNC1L, by reducing the device cost as well as introducing the capability for designers to develop their own application firmware and program the host controller themselves. VNC2 provides users with the ability to customise and develop firmware to run directly on the VNC2 device, without the need for an external MCU or processor. The software developed toolkit is based on the ‘C’ language and provides a comprehensive suite of object files to provide support for USB host functionality including USB Flash Drive (B.O.M.S.) storage, HID, USB COMMs class and FAT File functionality. VNC2 includes a new, customised 16bit MCU core, 256kB on chip programmable e-Flash program memory and 16kB of SRAM data memory. The IO communication capability has been enhanced to include 2 SPI slave controllers, 1 SPI master controller, 1 high speed UART interface (up to 3M baud) plus a flexible 8 channel PWM block allowing precise 16-bit control of motors, servos and other analogue application areas. In addition to these enhancements, VNC2’s 1-Pin debugger interface, which functions independently of the MCU core, provides a simple yet sophisticated debugging / device programming interface. All this at a substantially lower cost than it predecessor. VNC2 launches in 3 different pin-count sizes, 32LD, 48LD and 64LD supporting up to 44 user defined IO pins. Each pin-count size is available in LQFP or the more compact QFN package option - 6 variants in total. The 48LD LQFP version, offers a “close-fit” equivalent pin-out to the current VNC1L allowing easy system upgrades to the new VNC2, often with just a simple BOM change. Operating from a single +3.3 VDC supply, the VNC2 has a low standby current of typically 128uA and also has 3 low power modes. The Vinculum VNC2 suits a broad range of USB consumer and industrial related applications including camera, mobile accessories, data loggers, toys, keyboards, game controller interfacing, POS applications and USB to USB bridges.